"For Adam" - A Two-Night Local Music Showcase to Benefit Dog Days Adoption Event Inc. Bishop and Rook: "For Adam" - A Two-Night Local Music Showcase to Benefit Dog Days Adoption Event Inc.
"For Adam" - A Two-Night Local Music Showcase to Benefit Dog Days Adoption Event Inc.
'For Adam' is a two-night event in memory of musician Adam Haut (Civil Warblers / Matt & Adam) who passed away suddenly last summer from an undiagnosed heart condition. The showcase happens at Great Scott in Allston on Friday, May 6th and Saturday, May 7th, features 14 local bands and musicians, and benefits Dog Days Adoption Event Inc., a non-profit that assists small rescues and pounds to raise awareness of adoptable dogs by way of pop up events. "We are beyond adequately expressing our gratitude for being chosen as the recipient of this great outpouring of love and joy, in memory of a young man who adored dogs, nature, music and his friends and family," the organization's Facebook page states. 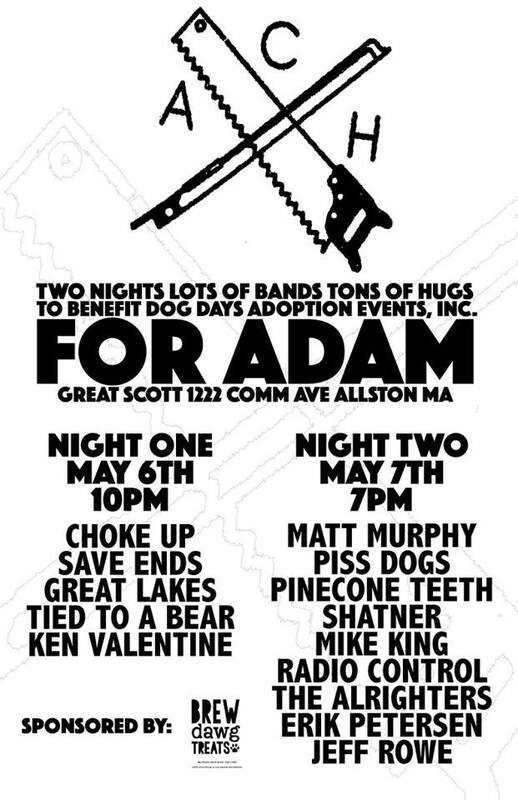 "Proceeds from this event will go to a fund started last year named "LETS GO" in honor of Adam, and used to pay for dog care expenses when owners can't afford them. Our deepest and most profound "thank you" to the event organizers for including us in this great honor and we wish you the greatest joy as you share memories and create new ones with friends by your side and Adam in your heart."